Michael Cera – "I have no perspective on myself whatsoever" – Winning. Words. Michael Cera – "I have no perspective on myself whatsoever"
Michael Cera is a quiet chap. Big Hollywood parties? He won’t be there. In-depth career discussions? He’s not fussed. Dating? “I have no idea. I’m still trying to figure it out.” According to Juno co-star Ellen Page he’s also “an incredibly sweet guy – honest, non-judgmental, and every good adjective I can think of”. 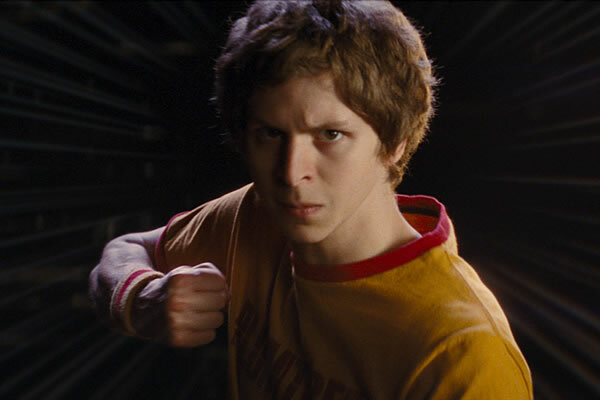 Yet despite the soft-toned bashfulness with which Cera has approached many of his on-screen roles, the 22 year old Canadian is heading up the loudest, brashest, most retina-sizzling super-movie of the year with comic book adap Scott Pilgrim Vs. The World. Word is that this leap from geek to chic – with Cera bringing the action as a fist-bruising Manga fighter – could represent a new phase in the young whippersnapper’s flourishing career. But is the nerd shtick really about to be given the kiss of death? Filming in Toronto with Hot Fuzz helmer Edgar Wright, the Pilgrim shoot is a return to the Ontario-hailing actor’s Canada roots. Born in 1988 to a Sicilian, Xerox technician father and a Canadian mother (his surname, pronounced ‘Seh-ra’, apparently translates from the Spanish word for ‘Wax’), Cera’s first post-commercials gig had him voicing a Noddy character in 1999. That same year, having lost an audition to star in The Sixth Sense and in a sign of Hollywood’s cyclical nature, Cera made his first on-screen appearance alongside future Pilgrim co-star Allison Pill in TV movie What Kady Did. As Scott, Cera takes the lead in a lush, POW!-packed comic book adap that draws on everything from video games and Manga lore to Skins-style twentysomething drama. In the ‘out there’ plot, Scott plays in a band (alongside Pill and Mark Webber), has a gay roommate who is frequently trouser-less (a phenomenal Kieran Culkin)… and must battle the seven evil ex-beaus of new love Ramona if he wants to date her (Chris Evans and Brandon Routh are among them). The ensuing scenes of sword-clashing conflict posed a fresh challenge that Cera whole-armedly embraced. Pilgrim is also a significant change for the actor, who primed himself as king of the geeks opposite Jonah Hill in the riotous Superbad (as the romantically challenged Evan) and in pregnancy drama Juno. Lanky and awkward but big-eyed and endearing – like a half-grown puppy still attempting to internally order the world – Cera’s popularity and profile hit the jackpot with those megabuck roles. By all accounts, Pilgrim could herald the dawn of a new Cera, one who rebuffs laurel-resting in favour of new opportunities. The actor’s appearance in this year’s darkly comic Youth In Revolt (in which he was deliciously funny as his character’s filthy imaginary alter-ego), and now Pilgrim certainly nod in that direction. So what does the future hold? A re-team with Jonah Hill seems likely. “We’re figuring it out,” Hill said recently. “I imagine that we’ll work together again at some point.” There’s also the Arrested Development movie, and a potential role in the big screen Gilligan’s Island. Looks like the quiet life is officially over for Cera. “For the most part, you just have to let go and go with it,” the actor notes. Previous Who the hell is Scott Pilgrim? Next Alan Arkin – "Long speeches take too long to learn!"